Welcome to the Reflection stage of the Imagine process. It is the time for your young superheroes to look back and celebrate the superpowers they have acquired both as individuals and as a collective through the Imagine phase.. The various activities under the imagine stage help in creating a sense of responsibility in the students for their challenge and also enhances skills such as listening, collaboration, creativity and problem solving. Taking a reference from ‘what’s your superpower’ video, you can conduct a quick introductory activity ​ by asking the students to share one new superpower they have learnt about themselves through imagine. This can become a fun activity if you ask children in a random order and ask them to respond very quickly to the call. Why do you think forming a best case scenario is an important step? What did you learn about you and your group through the brainstorming session? ​How are the things shared during the process applicable to other areas of your life? 3/2/1 Rule - Provide students with a 3-2-1 template and question prompts. For example: three things that interested you, two questions you have, and one surprise. Plus, minus and what's next - Students share whats going well, what isn’t and set a personal learning target. Think, pair and share- Students take a few minutes to think about the question or prompt. Next they pair with a partner to compare thoughts before sharing with the whole class. Two Stars and a Wish- The pairs provides feedback to their partner by giving them positive comments (two stars) and making one suggestion for improvement (a wish). One Minute Paper- Students respond to two questions in a one-minute paper and turn it in as they leave the room. 1. What was your most significant learning today? 2. What question is uppermost on your mind? Warm and cool feedback- The positive feedback can be called as warm and areas that need improvement can be called as cool feedback. Provide the students hints on 'how to raise the temperature' when they give advice about how their peer could improve their work. ​Traffic lights- Green for what the peer should continue to do, yellow for what can be elevated and red for what needs to stop. These are strategies that help the students connect to reflection in a vocabulary that's easy to understand. 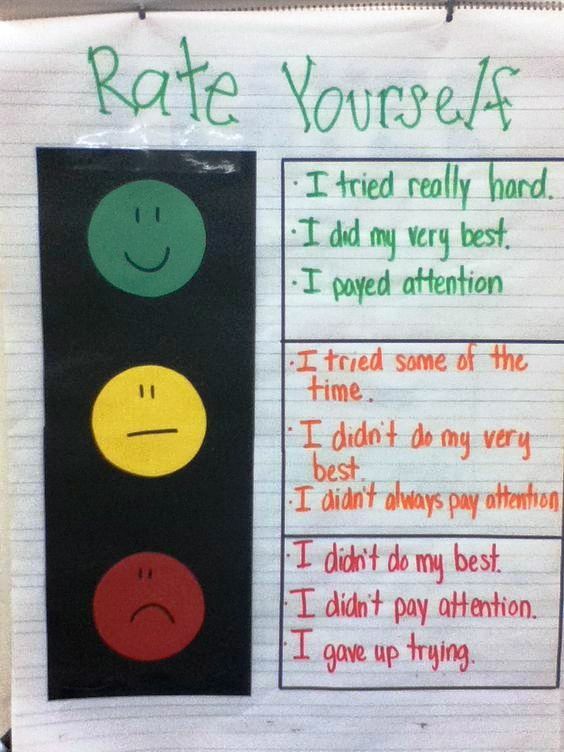 The student reflection will give you an understanding of the different pace each child is growing. Now if you mark the students, you will have more evidences to substantiate your thoughts and more strategies as well to plan further sessions. You will also be able to spot many trends by looking through the scores from the Feel Stage. This data can be highly instrumental for you in mapping the growth of individual children. Close the session on a jubilant note by leading the students to celebrate their journey so far. You can yourself initiate the process by appreciating the students who have shown more participation than usual by acknowledging their action (less sleepy, less distracted, building on ideas).